If you come to Spàin and only visit Madrid and the centre of Barcelona, you'd be doing yourself a grave disservice! Cataluña is one of the prettiest regions in the entire country and it's definitely worth exploring! You may be a bit chrunched for time, which is why a day trip is the perfect option! Here are a few suggestions to get you started! 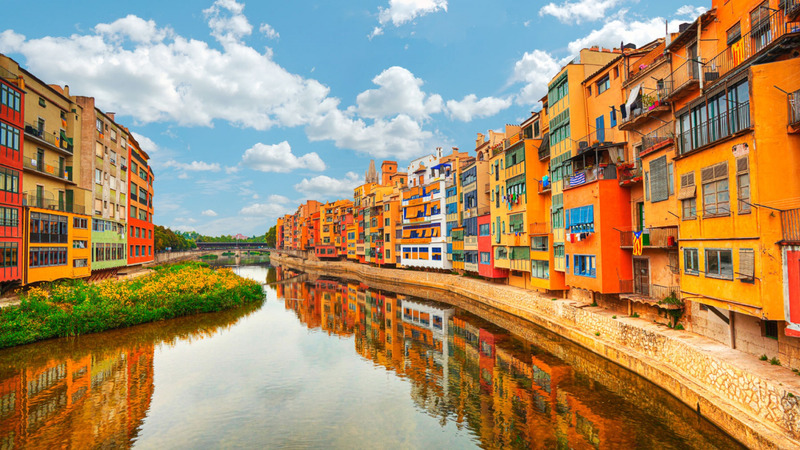 Girona is a colorful paradise that you won’t want to miss out on if you’re in the area. From the older houses to the medieval streets, you’ll feel as if you’ve been taken back into another part of time. If you’re a Game of Thrones fan, you’ll get to experience the city where the next season will be taking place and if you’re not, you’ll love it just the same. While in town, seeing the houses by the Onyar river is a must and once you’ve finished, make your way to La Devesa which is the largest urban park in all of Catalunya. For all of the nature lovers who want a pure escape, Serra de Collserola is for you. Escape city vibes all together and get lost in the mountains. Whether you’re into biking, hiking or just being surrounded by green you’ll want to stay forever. 22 times bigger than Central Park, there is a lot of territory to cover but no worries, if you get tired there are different options to make your way up and back down. If you’re looking for a city with ancient vibes and beautifully serene beaches, Tarragona is the place to go. Only around an hour away, the city has everything you need and beautiful views, even if you can't dip in the water. Not to worry, the Mediterranean sea isn’t all that the city has to offer. There is also a plethora of Roman ruins and architecture that can be found exploring the winding streets. Devour Spain is a well-known food tour company that we often recommend and partner with because their tours are such high-quality. They invest in local businesses and employ informed, passionate and engaged guides. This is a wine and tapas tour, and one of the most straight-forward ways to get to know Catalunya! So, if you want to get to know Barcelona through the eyes of a local... check out the tours by Trip4Real. They host various tours and workshops that are available to you and led by those who have been in Barcelona for some time. We recommend looking into what they have to offer and deciding based on the desires of your group. Some of our favorites are the graffiti tour, creative tapas cooking class and winery + bike tour. End your relaxing day with live music and a sunset cruise! You can capture the wonderful images and changing colors of Barcelona city skyline while listening to live music. The cruise typically last 90 minutes. Be sure to arrive at least 30 minutes early to get a good spot onboard! So! Where are we headed? Don't forget to #LMDES on your adventures!